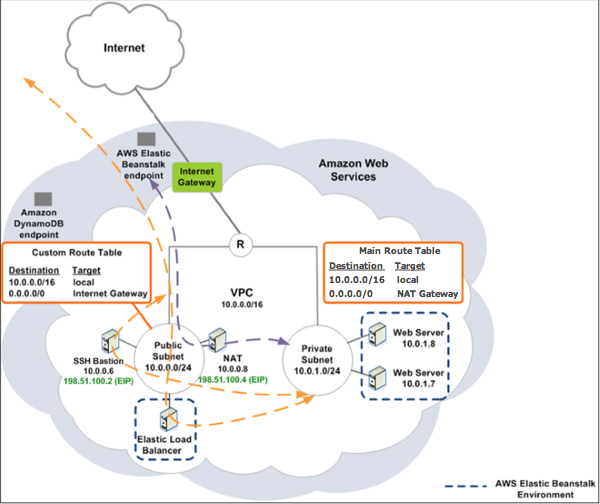 Complete all of the procedures in VPC with Private and Public Subnets. When deploying the application, you must specify an Amazon EC2 key pair for the instances so you can connect to them remotely. For more information about how to specify the instance key pair, see Your AWS Elastic Beanstalk Environment's Amazon EC2 Instances. Create a security group for the bastion host, and add rules that allow inbound SSH traffic from the Internet, and outbound SSH traffic to the private subnet that contains the Amazon EC2 instances. In the Create Security Group dialog box, enter the following and choose Yes, Create. Enter a name tag for the security group. Enter the name of the security group. The security group is created and appears on the Security Groups page. Notice that it has an ID (e.g., sg-xxxxxxxx). You might have to turn on the Group ID column by clicking Show/Hide in the top right corner of the page. In the list of security groups, select the check box for the security group you just created for your bastion host. On the Inbound Rules tab, choose Edit. If needed, choose Add another rule. If your bastion host is a Linux instance, under Type, select SSH. If your bastion host is a Windows instance, under Type, select RDP. Enter the desired source CIDR range in the Source field and choose Save. On the Outbound Rules tab, choose Edit. Under Type, select the type that you specified for the inbound rule. In the Source field, enter the CIDR range of the subnet of the hosts in the VPC's private subnet. Note the value under IPv4 CIDR for each Availability Zone in which you have hosts that you want the bastion host to bridge to. If you have hosts in multiple availability zones, create an outbound rule for each one of these availability zones. By default, the security group you created for your instances does not allow incoming traffic. While Elastic Beanstalk will modify the default group for the instances to allow SSH traffic, you must modify your custom instance security group to allow RDP traffic if your instances are Windows instances. In the list of security groups, select the check box for the instance security group. On the Inbound tab, choose Edit. Enter the following values, and choose Save. Enter the ID of the bastion host security group (e.g., sg-8a6f71e8) and choose Save. To create a bastion host, you launch an Amazon EC2 instance in your public subnet that will act as the bastion host. For more information about setting up a bastion host for Windows instances in the private subnet, see Controlling Network Access to EC2 Instances Using a Bastion Server . For more information about setting up a bastion host for Linux instances in the private subnet, see Securely Connect to Linux Instances Running in a Private Amazon VPC .